Designed to provide hearing that closely resembles how a normal ear hears, AB’s HiRes Fidelity 120™* sound processing captures and delivers the full dimension of sound for a more complete hearing experience. Only HiRes Fidelity 120 offers five times more sound resolution than any other cochlear implant system – 120 spectral bands – to help you or your child hear all the colorful details of sound: birds chirping, rain falling, the various layers of music. And with HiRes Fidelity 120, your child has the opportunity to hear all the details necessary to understand speech and develop strong language skills. *Not approved for pediatric patients in the United States. 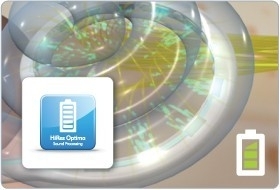 This new sound processing strategy is designed to optimize battery life while delivering the same great performance of HiRes Fidelity 120 with AB’s unique current steering technology. Just the way a high-definition television delivers a higher-quality visual picture, HiRes Fidelity 120 is designed to deliver a higher-quality sound representation. The higher the spectral resolution, the better a recipient can hear a frequency or “pitch.” High spectral resolution is particularly important for listening in noisy environments as well as hearing and appreciating music. AB’s HiRes Fidelity 120 delivers the highest spectral resolution – 120 spectral bands for five times more than other brands – to help you hear every word of your important meeting or every note of your favorite song. Spectral resolution refers to how well the cochlear implant delivers frequency, or “pitch” information, to the inner ear through a proper sound intensity. Typically, cochlear implant recipients hear different pitches when different electrodes are stimulated and when the rate of the stimulation varies. The better the spectral resolution, the better you can hear these pitches for better hearing in noise and music enjoyment. Improved spectral resolution is designed to more closely resemble normal hearing. This important study proves that Harmony recipients have the opportunity to hear and enjoy music better than ever before.2,3 HiRes Fidelity 120* sound processing is the only strategy that can implement simultaneous current steering to deliver the dimensions of music (loudness, pitch, timing) for a full musical experience. AutoSound’s programmable wide Input Dynamic Range (IDR) and automatic volume control adjust automatically so that you don’t miss a note. And the naturally placed T-Mic microphone makes it effortless to use your MP3 player. This advanced technology only from AB works in concert so that you can hear your best. 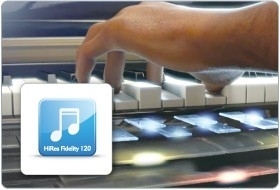 AB’s HiRes Fidelity 120* strategy is compatible with Naída CI, Neptune, Harmony and PSP sound processors. Firszt JB, Koch DB, Downing M, Litvak L. (2007) Current steering creates additional pitch percepts in adult cochlear implant recipients. Otology and Neurotology, 28(5):629-636. Limb C. 2006. Cochlear Implant-Mediated Perception of Music. Current Opinion in Otolaryngology & Head and Neck Surgery. 14:337–340. Firszt JB, Holden L, Reeder R, Skinner MW. (2009) Speech recognition in cochlear implant recipients: comparison of standard HiRes and HiRes 120 sound processing. Otology and Neurotology 30:146–152.